I was having a particularly bad day the other day, and decided to take my mind off everything by going for a stroll through the aisles of Clicks. Clicks is one of my favourite shops to go to because I’m bound to discover something new, and you guys know how much I love trying out new products. So I was walking along the skin care aisle, minding my own business when something caught my eye…Oh So Heavenly products…in the skin care aisle. My flabber was gasted and I immediately knelt down to inspect. Yes, ladies…Oh So Heavenly has now launched a range of skin care products! I actually wish I had taken notes of all the products that were on display but from what I can remember, there are: Face cleansers (for various skin types), toners, a face mask, a day cream, a night cream and an eye cream. I also saw 2 BB creams (Light & Medium) and a makeup primer. 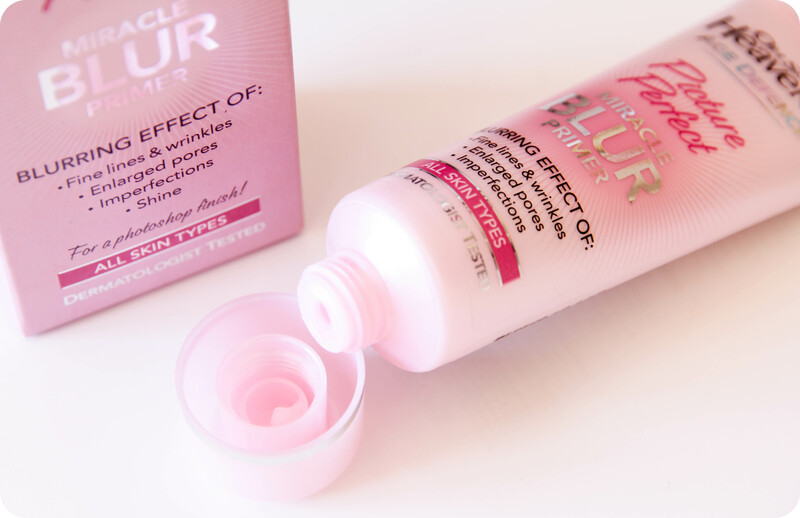 I decided to pick up the Oh So Heavenly Picture Perfect Miracle Blur Primer, as it’s the only product from the bunch that I would be able to test out immediately (since I’m already testing out other skin care products) and one really only needs to use a makeup primer a couple of times to know whether it works for you. I didn’t get the BB cream because the lightest shade is actually quite dark (and very warm-toned). I paid for the primer (R 119,95) and as I was driving home, I started thinking about a series I could start on my YouTube channel. I wanted to do something different (and challenging), a quick review video, almost like a race against time type thing and then decided on a ’60 Second Review’ series. As mentioned in the video, I think most people start to lose interest after about 5 minutes of watching a YouTube video (2 minutes if the person is boring) and since I know there are still a lot of South Africans who do not have uncapped data, I thought a quick review in 60 seconds would be fun – yet challenging. Boy, was I right…doing a review in under 60 seconds is no joke! 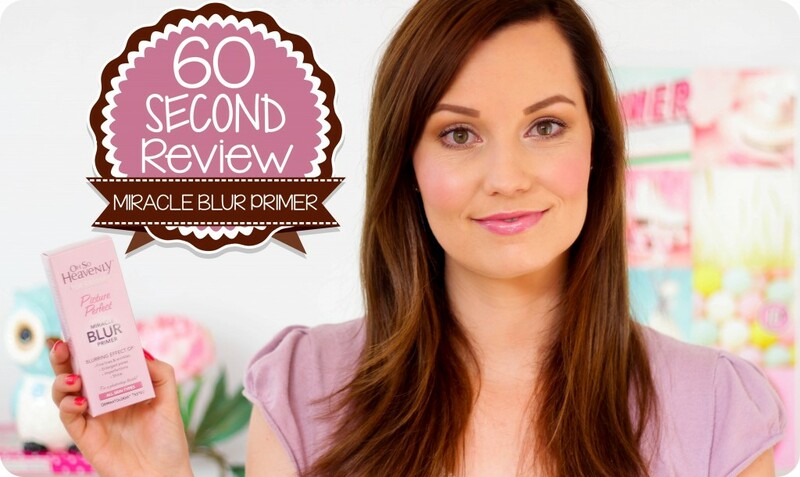 So if you would like to see whether the Oh So Heavenly Picture Perfect Miracle Blur Primer is worth the money, then click on the YouTube video below. If you would like to watch the video on a bigger screen, just click on the ‘YouTube’ button in the bottom right-hand corner of the video screen above. If you would like to see more videos from me, please subscribe to my YouTube channel. Subscribing to a YouTube channel will keep you up-to-date with the latest video updates from your favourite vloggers, that means you won’t have to go search for that specific vlogger or new video on YouTube. Each new video will appear in your ‘My Subscriptions’ tab on the left when you open up YouTube. I hope you enjoy the video! Let me know in the comments section below if you think I should continue doing these ’60 Second Review’ videos and if there are any products you would like me to review as part of this new series. Thank you so much for taking the time to pop onto my blog and watching my videos – I really appreciate your support. P.S. While I was editing this YouTube video, I noticed my teeth were looking brighter than normal & I think it’s mainly due to the Oral-B Pro-Expert toothpaste I’ve been testing out. My full review on the toothpaste will be up beginning of October as I need to trial the toothpaste for a full month. Thank you so much for this honest review! Have you reviewed the Smashbox Photofinish Primer yet? Any comments on the Sh’zen range (especially their face care products)? Hi Elmien! 🙂 I haven’t reviews any Smashbox Primer here on the blog as yet, BUT their new Pore Minimizing Primer very high up on my ‘To Get’ list, so will buy it & do a review on that one. I have used the Photo Finish Primer with Dermaxyl Complex for the last year or so and I really like it. It has anti-aging properties and makes my foundation glide on really nicely (and adds to the longevity of my makeup too). Jy is altyd een van die eerste bloggers wat nuwe produkte ontdek – ek love dit oor jou! Ai tog, ongelukkig was dit nie ‘n wenner vir my nie. Just love your videos ! Great review haven’t used this product before. You’re welcome, Sharleen. 🙂 Thank you for taking the time to leave a comment. I think its a super idea. Sometimes its nice to get straight to the point. You look lovely in the video!!!! I agree, sometimes short and concise videos are great too! Love the 60 second idea. You are such a breath of fresh air as a beauty blogger… love it! I love short review videos and thank you for your honesty. I agree, the product doesn’t deliver what it claims to and definitely not worth the price! However, my complaint is on a different note. This product is cruelty-free and approved by Beauty Without Cruelty ( check for the Bunny on the back ) and the main reason I bought it! Oh So Heavenly used to be a lower-end “economical ” brand until they decided to get approved by BWC. I feel that they, like many other Brands , have jumped on the cruelty-free bandwagon. Basically what I’m saying is that I feel exploited. Just because I don’t eat animals doesn’t mean I’ll buy a product just because it’s cruelty-free! Like everyone else, I want cosmetic products that deliver what is promised. I have tried all their cruelty-free products and I’m not impressed ( although they do smell nice ). I use an excellent imported Vegan shampoo and conditioner, for example, purchased from Diskem…which is also paraben free and they’re only R59 for a 354ml bottle! This review doesn’t really surprise me although I love Oh So Heavenly products. I tried out their anti-ageing eye cream once, and after 1 week, the skin around my eyes were so dry, I immediately stopped using the product and bought a different brand which then did wonders for my skin. So I tend to stay away from the Oh So Heavenly’s facial skincare range. Their body products are so much better (body butters, hand creams and shower creams / gels).